Two of the NFL’s top tight ends were injured Sunday and one is lost for the year. It’s bad enough that Jimmy Graham’s inaugural Seahawks campaign is done; however the injury may affect his 2016 season as well. Although both are season ending and require surgery, patella tendon tear is often worse than even an ACL tear. Graham collapsed on his right leg in the end zone, but by video, the injury happened on the previous step. With the application of an aircast, many wrongly assumed leg fracture. My worst fear of knee extensor tendon rupture were confirmed postgame by head coach Pete Carroll. The surgery is the easy part. The rehab is the hard part. Patella tendon repair is not an arthroscopic procedure, rather it is a simple open repair where the tendon is sewn together and often augmented with suture through drill holes in the bone. The kneecap tendon is well over an inch wide and is larger, broader and stronger than the ACL. The open incision and early immobilization required leads to more scar tissue, loss of motion and atrophy. In ACL surgery, an arthroscopic is used and patients are encouraged to move and bear full weight immediately after surgery thus speeding recovery. The grueling rehab takes a minimum of 6-9 months; however, the struggle to regain explosiveness and full power goes well beyond that. Giants WR Victor Cruz never made it back from last season’s patella tendon tear, but his recovery was complicated by a calf strain. Patriots LB Jerod Mayo did make it back this year; however, his per game productivity is only a quarter of that pre-injury. Through Week 12, Mayo has 22 combined tackles compared to 53 in only six games last season before his tendon rupture. The Seahawks tight end hopes to fair better than these two comparisons. Cruz relies on explosiveness, while Graham can use his big body. Offensive players have an advantage as they can dictate and plan their moves, where it is harder for defenders like Mayo who have to react instantaneously. By all accounts, Graham is a great kid and a hard worker. We all wish him well and hope he can come back strong as the new standard for patellar tendon recovery like Adrian Peterson set the new standard for ACL return. The Patriots would gladly take Sunday night’s loss if they can get their star tight end back. The video of a ferocious hit to the legs and Rob Gronkowski writhing in pain scared everyone. 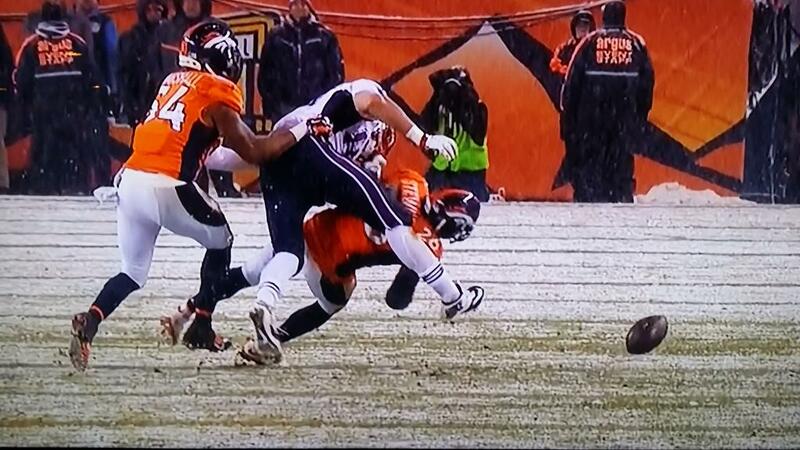 On further film review, the right foot being off the ground likely saves Gronk from serious injury. My hope/expectation in real time was for contusion/bone bruise or possible mild knee sprain (LCL/PCL) without structural damage. MRI will be obtained this AM. Early source reports, video of Gronk walking and dressing normally seem to indicate optimism. Hope this star tight end meets a better fate than Graham’s season ender. In the aftermath of the Case Keenum controversy, it was refreshing to see Ben Roethlisberger report his head injury symptoms and to have the Steelers act immediately to remove him despite it being a close game late in the fourth quarter. Cynics would say Big Ben only came out after being down by two scores, but Roethlisberger was already being looked at before the Seahawks final touchdown. The spotter’s job is proving to be a hard one as the medical timeout rule was once again not used here. We cannot be sure when the potential concussion happened, but by video, it was likely on the roughing the passer penalty where Roethlisberger took a hit to the head and stayed down briefly. He played nine more plays in that drive. No one will be penalized in the Keenum case, but here is the second week in a row a starting QB was not immediately removed for evaluation. The “eye in the sky” and the unaffiliated neurotrauma consultant (UNC) were put in place specifically for this job. My guess is the league will instruct spotters to be more aggressive in calling medical timeouts going forward. When something goes wrong, human nature is to look for responsibility. I don’t believe the Dallas medical staff deserves any blame in Tony Romo’s clavicle re-fracture. Fractures don’t heal like a light switch, more like a gradual sunrise. In order to be as strong as the other side, it would take six months, yet the NFL average return is 6-8 weeks. Romo was re-injured 10 weeks out and I am sure he was informed of increased risk. Unfortunately, as he was sacked, he instinctively rolled onto his vulnerable left side to protect his throwing shoulder. Romo’s hairline fracture will heal well without surgery. He now will have the full six months to heal as strong as possible. I see no medical issue with his clavicle moving forward for 2016. Marshawn Lynch “popped a muscle off his pelvic bone” and had surgery to repair it. Whether it is called sports hernia, athletic pubalgia or core muscle, the anatomy and recovery are the same. Sports hernia is certainly a misnomer since there is no true hernia. Although injury severity varies, average recovery in the NFL is approximately six weeks. After surgery in Philadelphia this season, Zach Ertz returned at four weeks and Arian Foster took eight weeks. The hope is Lynch can return and be effective for playoffs. Aaron Rodgers hurt his “funny bone” and it initially looked worse than it was. The injury is neither funny (quite painful) nor is it a bone (ulnar nerve). He holds the outside of his wrist/hand as that is where the pain radiates. The good news is that typically symptoms resolve quickly and Rodgers won’t miss time. Peyton Manning is in a walking cast for his plantar fasciitis. Even if the cast comes off today, he is unlikely to be ready for Week 13 or 14. These injuries linger. Russell Wilson needed three liters of intravenous fluids during the game. He woke up with flu-like symptoms but still led the Seahawks to a win. Andrew Luck has now missed two games with his kidney laceration. This injury is a safety issue and typically the minimum is four weeks, if not more. Sam Bradford has missed two games with his concussion and shoulder injury. He has been cleared from concussion and his presumed left AC joint sprain is mild. Look for him to be good to go this week. Carlos Hyde missed his fifth week with a foot stress fracture. Assuming he has a Jones fracture, the procedure carries a 6-8 week recovery. In retrospect, it seems surgery might have been the better move. Danny Amendola missed this week with what I presume to be a mild PCL sprain, which is a 1-4 week injury. Question is how effective he can be in stopping and changing directions when he first returns. Geoff Schwartz fractured his ankle and is undoubtedly headed to IR. Chris Culliver had an unfortunate Thanksgiving Day practice injury. He tore his ACL and will need surgery. Allen Hurns was taken to the hospital but has been already discharged. He has a concussion but his neck is reportedly fine. Chris Johnson and Andre Ellington both exited the Cardinals game. The hope is Johnson’s knee and Ellington’s foot injuries are relatively minor. Dont’a Hightower missed the second half with a knee injury. Video was inconclusive on a mechanism, which hopefully is a good sign that it is minor. A report surfaced of a MCL sprain which I hope is minimal. Justin Houston did not return from a hyperextension knee injury. The hope is for a mild knee sprain and/or minimal bone bruise and an early return. Karlos Williams left the game with an unknown shoulder injury that I did not see by video. This was an up and down week with some good video calls and some key misses that will lower the prediction percentage below 95% (98-5 thru last week). I correctly indicated Keenan Lewis season was over but it seems to be his MCL not ACL. By video, Dominique Rodgers-Cromartie knee seemed to give way but he was announced as an ankle injury and returned. Jimmy Graham was a good call on patella tendon tear. Aaron Rodgers immediate funny bone diagnosis came despite beat reporters tweeting wrist injury. Allen Hurns hospitalization was precautionary. Peyton Manning indeed has missed more than the initial week. Marshawn Lynch had sports hernia surgery as predicted. Danny Amendola knee sprain does seem to be a PCL injury. The Tony Romo call of re-fracture was an easy one. Carlos Hyde’s extended absence was anticipated. Tyrod Taylor played through his mild shoulder separation. Bryan Bulaga ankle injury was minor. Rob Gronkowski and Justin Houston calls will have to be evaluated next week as more information is known. This brings the 2015 total to 108-7 or 93.9%.